All us knitters, crocheters, seamstresses, tailors, cross-stitchers, potters, jewelry makers, bakers, cooks — crafters — know this story. Most of us can remember the day we touched our mediums, were taught techniques, felt drawn to particular projects. We know this story, so I know you’ll be drawn to this particular giveaway. What we also know is how our crafts make us feel, the times they’ve helped us pull through and the way we use them to make ourselves and others feel loved. I promise you that the book has this — the exhibition of her strength through knitting — and more. There’s something in each chapter that would resonate with crafters and non crafters alike. Maybe for you non-crafters, her story might encourage you to pick up some sticks or some creative medium and make creativity and its benefits part of your own life story. Are you gamed? Prize: One electronic copy of Robyn’s book after the release date April 29th 2014. Method of Entry: Leave a comment in the comment section of this post letting me know what item(s) you like to make most. Your craft medium doesn’t matter, so every crafter can enter. Non-crafters can enter too!!! Just leave a comment letting me know what crafts are on your “to learn” list. Please leave your email address or Ravelry ID so I can contact you if you win. Easy peasy! The winner will be selected by random drawing on March 4th 2014 and notified by midnight on the same day. If I don’t get a response from the winner within two days of notification, I’ll do another random drawing and select new winner. I would love to read this book because hats are my favorite too! It’s like a swatch, but useful. 😉 I make lots for charity and have never thought to count them. Hmm, maybe I should use my Ravelry to guestimate. Socks are a close second for favorites. There is nothing quite like the feel of pulling on handknit socks. I’m just happy when I make it to 10,000 stitches, lol. Knitting is my favorite, but I’m also trying to incorporate some crocheting to bring some variety into my projects. I also occasionally do some beading as well though it’s been a really long time since I made any bead projects. 10,000 hats! That’s pretty impressive. 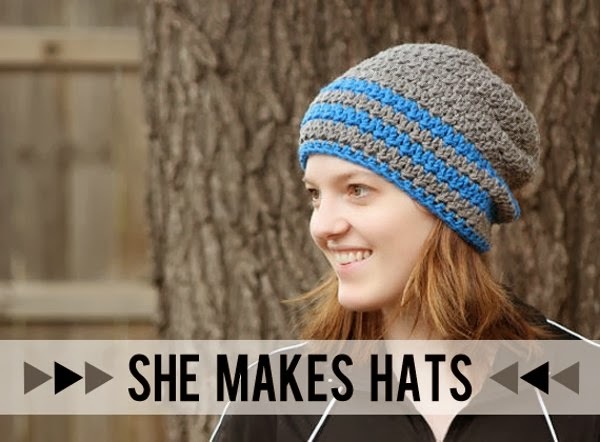 I’ve made a hat or two and they were pretty fun! I love knitting scarves, but I feel like my creativity shines the most when I am making jewelry. I’m not tied to a particular pattern so I’m free to create looks that are entirely my own. I will definitely check out her site! Sounds like a very interesting book! As you may have guessed 😉 my favorite thing to knit is SWEATERS! I just love having items in my wardrobe that were made with my own hands, specifically for me, rather than purchased at a store from whatever selection someone else has chosen. I really need to learn how to sew, to expand my garment-creating capabilities even more. My favorite thing to knit is cardigans. Right now I’m having a great time with sewing related crafts. Someday, I’d like to learn to sew a dress. Love the new look for the blog! 10 000 is a milestone that is impressive no matter what it represents. That is very awesome. Glad to see you Nicky, hope you have a great week. I would love to have a chance to win a copy of 10,000 hats. Right now in the craft world knitting has taken over, but I also draw and paint. There are plans in the future to learn to spin and use a potter’s wheel. Nikki, I owe you a big email. Lots has happened this year already.